Today, let's learn some English about Halloween! Tomorrow, October 31st, is "Halloween", and it means "All Saint's Day Eve", which is like Japanese "obon". 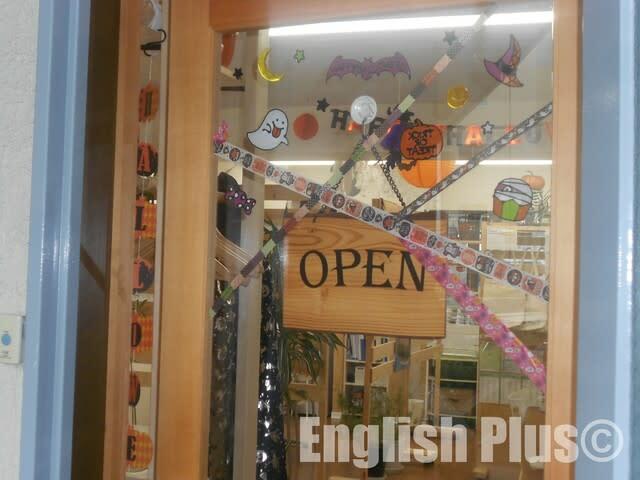 For this Halloween season, we usually decorate English Plus with Halloween items. Since Halloween is tomorrow, today let's learn some English vocabulary about Halloween. When you have a chance to see one of the objects above, try to say it in English in your mind. Let's learn and improve English every day. If you have any questions about English Plus, please ask us any questions from English Plus Official Website. 今日の答え："１．魔法使い ＝ wizard / ２．魔女 ＝ witch / ３．ほうき ＝ broom / ４．（魔法使いの）杖 ＝ wand / ５．骸骨 ＝ skeleton / ６．ミイラ ＝ mummy"